We are accustomed to thinking of “national security” as the domain of expert policy professionals, military institutions, and those with clearance to see materials not released to the public. 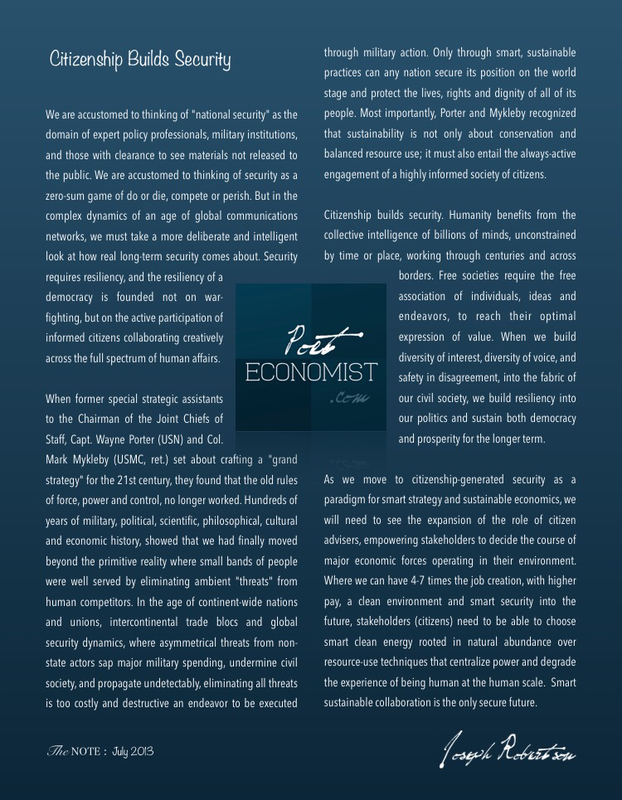 We are accustomed to thinking of security as a zero-sum game of do or die, compete or perish. But in the complex dynamics of an age of global communications networks, we must take a more deliberate and intelligent look at how real long-term security comes about. Security requires resiliency, and the resiliency of a democracy is founded not on war-fighting, but on the active participation of informed citizens collaborating creatively across the full spectrum of human affairs. When former special strategic assistants to the Chairman of the Joint Chiefs of Staff, Capt. Wayne Porter (USN) and Col. Mark Mykleby (USMC, ret.) set about crafting a “grand strategy” for the 21st century, they found that the old rules of force, power and control, no longer worked. Hundreds of years of military, political, scientific, philosophical, cultural and economic history, showed that we had finally moved beyond the primitive reality where small bands of people were well served by eliminating ambient “threats” from human competitors. In the age of continent-wide nations and unions, intercontinental trade blocs and global security dynamics, where asymmetrical threats from non-state actors sap major military spending, undermine civil society, and propagate undetectably, eliminating all threats is too costly and destructive an endeavor to be executed through military action. Only through smart, sustainable practices can any nation secure its position on the world stage and protect the lives, rights and dignity of all of its people. Most importantly, Porter and Mykleby recognized that sustainability is not only about conservation and balanced resource use; it must also entail the always-active engagement of a highly informed society of citizens. Citizenship builds security. Humanity benefits from the collective intelligence of billions of minds, unconstrained by time or place, working through centuries and across borders. Free societies require the free association of individuals, ideas and endeavors, to reach their optimal expression of value. When we build diversity of interest, diversity of voice, and safety in disagreement, into the fabric of our civil society, we build resiliency into our politics and sustain both democracy and prosperity for the longer term. As we move to citizenship-generated security as a paradigm for smart strategy and sustainable economics, we will need to see the expansion of the role of citizen advisers, empowering stakeholders to decide the course of major economic forces operating in their environment. Where we can have 4-7 times the job creation, with higher pay, a clean environment and smart security into the future, stakeholders (citizens) need to be able to choose smart clean energy rooted in natural abundance over resource-use techniques that centralize power and degrade the experience of being human at the human scale. Smart sustainable collaboration is the only secure future.